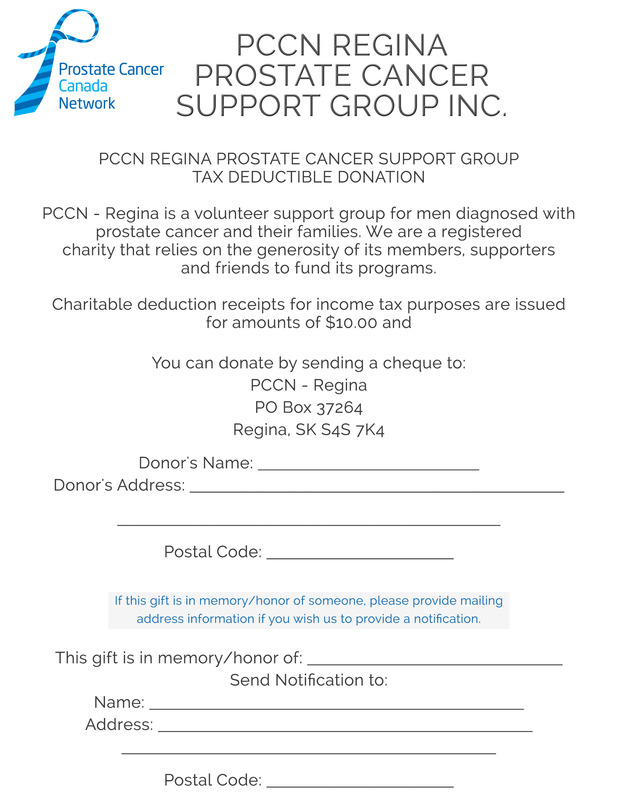 PCCN-Regina is a volunteer organization of men with prostate cancer and their spouses, friends and families. There are no fees or other charges for joining us at our meetings or other events. Our focus is on support, not fundraising. Donations are used to support our information services: meetings, brochures, website, information tables, etc. We are registered as a charitable organization with Canada Revenue Agency (CRA), therefore we are able to issue tax deduction receipts for donations. – If you would like to make a donation to support our meetings, brochures, website, and other awareness activities, please contact us by email (pccn.regina@gmail.com) or phone 306-543-8215. – We are associated with, and support the fund-raising activities of Prostate Cancer Canada. Their mission is to raise funds for the development of programs related to awareness, public education, advocacy, support of those affected, and research into the prevention, detection, treatment and cure of prostate cancer. – The medical information on this site is provided as an information resource only, and is not to be used or relied on for any diagnostic or treatment purposes. This information should not be used as a substitute for professional diagnosis and treatment. Please consult your health care provider before making any health care decisions or for guidance about a specific medical condition.